My daughter is turning four and, having recently started ice skating lessons, begged us for an ice skating party. We are using Barbie and the Magic of Pegasus as our theme, since the movie has a strong ice skating motif running throughout. INVITATIONS: We found a screenshot from Barbie and the Magic of Pegasus, showing Barbie ice skating. We used this as the front cover of the invite, then included the party specifics on the inside. Licensed invites are available to purchase through party outlets, but we wanted to focus more on the ice skating aspects of the movie. 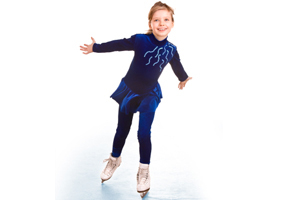 DÉCOR: The party will take place at an ice rink, but we do have the use of a party room at the rink. We purchased various Barbie Pegasus items and are supplementing with snowflake balloons, white gossamer fabric bundled into cloud shapes, snowflake confetti/garland, streamers, etc, all in ice blue, lavender and baby pink colors. The main highlight of the décor will be the cake -- a Barbie doll cake set on top of a sheet cake made to look like ice using decorator's gel. ACTIVITIES: We were able to rent private time on the ice (only our guests will be present), a party room, skate rental, pizza and pop for $150 for two hours. While skating, the rink will play a CD of our daughter's favorite music. We hired our daughter's skating coach to come to the rink to help the kids skate, play games, etc. (Note: Professional skating coaches have special insurance that covers them -- and you -- in case anyone has an accident. Our rink made us sign a waiver saying that they would not be liable in the case of accident, so having this added security was a relief to us.) This only cost us about $40 for an hour. The rink also has bumper cars on ice, so half the time will be spent skating, the other half will be spent doing bumper cars (with parents driving the cars). We are borrowing a LCD projector and are showing the Barbie and the Magic of Pegasus movie in the party room for anyone who doesn't want to skate. FOOD: The rink provides pizza and pop, but we are allowed to bring in any other items that we wish. We will bring in a Barbie doll cake, strawberries (a favorite of my daughter's), pretzels and other goodies. DRESS: I am sewing a new skating dress for my daughter modeled after Barbie's dress in the movie and have purchased a flower girl tiara for her to wear as well. We will bring dress up clothes for any of her friends who want to wear them over their clothes as well."